There’s a plaque at the Sonoma County Museum noting the building was “designed by James Knox Taylor.” Perhaps that line should be taped over, or at least a question mark added. A bright red question mark. 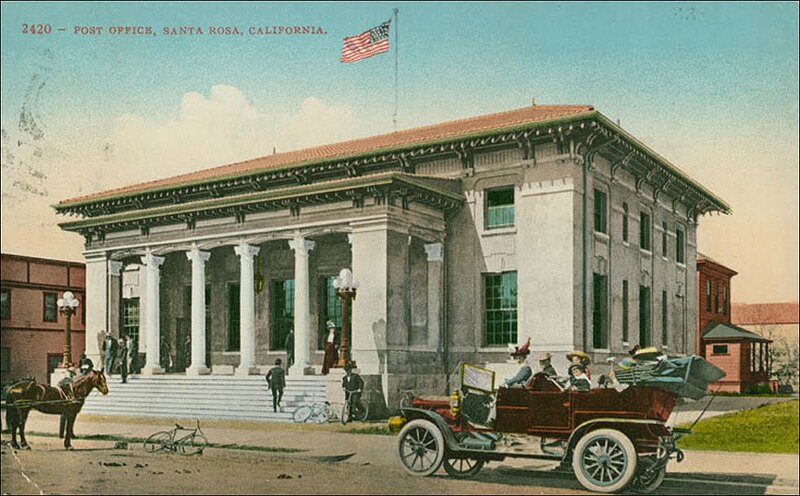 The magnificent old place was once Santa Rosa’s post office. 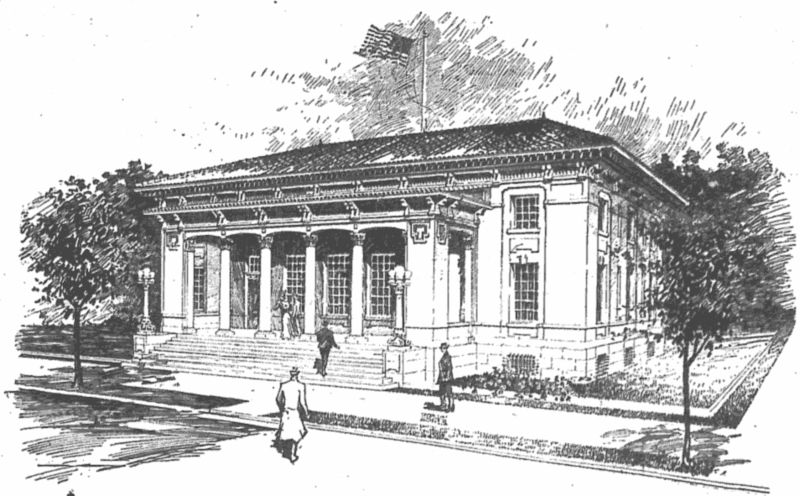 Even before the 1906 earthquake, the town’s Congressman requested funds for a new federal building because the post office had outgrown its 19th century rooms in the old Athenaeum, Santa Rosa’s opera house. When that building collapsed in the quake, the post office temporarily relocated to the tent city on a Mendocino street vacant lot (along with almost every downtown business). After that, postal workers operated a window at a grocery store as they waited for a new home to be built by the government. And waited. 1906 turned into 1907, then 1908, when the Squeedunk parade mocked the endless delays with a float portraying a vacant lot surrounded by a worn fence. Finally, the blueprints arrived from Washington (now available online via the Library of Congress). On each page was stamped the signature and title of “James Knox Taylor Supervising Architect Treasury Department”. James Knox Taylor was in charge of the Office of the Supervising Architect, a Treasury subdepartment that designed and commissioned federal buildings as well as awarding construction contracts. It was a job of tremendous responsibility; he managed an annual budget and inventory worth around $25 million, which would be closer to a billion dollars today. 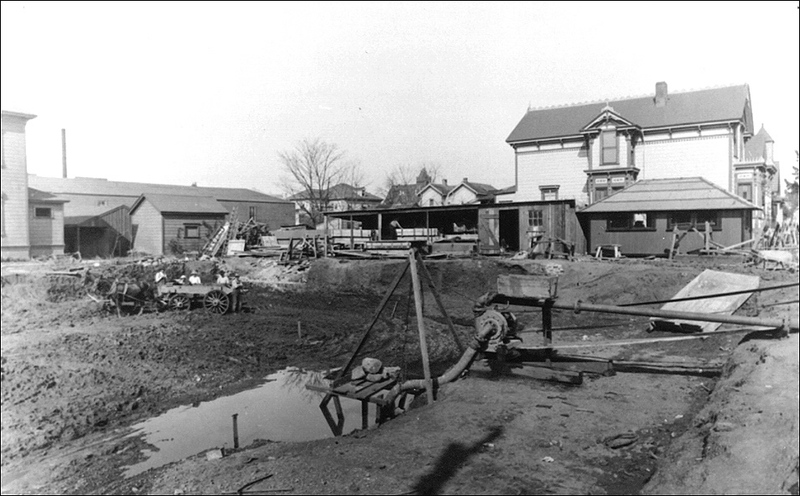 In FY 1909, when work was underway in Santa Rosa, he had 134 new buildings under construction or recently completed, additions or major repairs on dozens of others, and a further 263 projects somewhere in the pipeline, clamoring for attention. Taylor’s appointment in 1897 to this post surprised many. It was usually a political patronage job and the designs produced by the Office were generally considered lackluster (one critic at the time called the work “excretable”). But Taylor had worked as an architect himself – albeit one who couldn’t make a living at it. Although he wasn’t the Treasury Department’s first choice, he was selected because he had been a draftsman there for three years and knew how the large Office functioned, and also because he wrote a convincing essay that outlined his philosophy: That public buildings shoud have a dignified style, be beautiful, and be pleasant to work in. Taylor quickly transformed the Office into a true architectural studio that turned out designs that might not have been the best of the day, but were certainly nothing to be ashamed of. He also awarded commissions to top architects for prominent buildings in major cities, which earned him high praise from top architects. Alas, that policy proved his undoing, and he resigned in 1912 amid a scandal that he gave one of these valuable contracts to his former partner from their failed architectural firm. In sum: It can be claimed James Knox Taylor was the designer of hundreds of public buildings in the same sense that hundreds of cartoons were “made by Walt Disney.” The man with his name on the title signed off on the final product, but likely didn’t do much of anything to shape the work; it was his talented employees who were the real creators. So who does deserve our thanks for that beautiful building? The only full name on the blueprints is Taylor’s Supervising Architect stamp, and the actual draftsman is anonymous draftsman’s name can be read as “Smith” on some pages of the blueprints. The only other name associated with the building’s creation is one William N. Collier, and he was an engineer sent to oversee construction, not an architect. Does that mean the same unknown architect designed all of the 1909-1910 California post offices? Possibly, but if they look enough alike to be a set of fraternal triplets, the East Coast federal buildings of the same vintage can be recognized as their first cousins. You’ll spot the same Beaux Arts-Neoclassical look – particularly in the shape of the oversized windows and doorways – at Saratoga Springs, NY, Selma, Alabama and Sault Sainte Marie, Michigan, among others. Slap a hipped tile roof and a portico-colonnade on any of these buildings and they’d fit right in with the “California” style of architecture coming from Taylor’s office. (UPDATE: On further study, even the hipped tile roof can be found on post offices in the South and Southwest from this period – one example is Bessemer, Alabama.) I think the best conclusion is that the designer/architects were following the Office pattern book and not their muse. Our treasure of a federal building was officially completed on March 1, 1910 for a total cost about $60,000. And so everything remained for 55 years, until the current post office was built in 1965 on Second street. The government sold the old building to Sonoma County, which used it as a data processing center. In 1977 it was sold again to the Santa Rosa Urban Renewal Agency, which was itching to get rid of it to make room for a shiny new mall that guaranteed lotsa’ renewing would follow. The building was slowwwwly moved from its original location at 405 Fifth street (on the corner of A street, an address now obliterated by the mall parking structure) about 750 feet to Seventh street. We should be very grateful that Santa Rosa didn’t just rip it down, as it recklessly demolished most of the rest of its history. The old post office deserves to be better appreciated. If a drama were written about the history of Santa Rosa (R-rated, for sure), the first act would be set in a downtown saloon, sweaty, dank and thick with the grit of the Old West. But the scene for act two would be on the sunshined steps of the post office, because that’s where you bumped into everyone every day during the decades when Santa Rosa bloomed. This was the heart of the charming place that Alfred Hitchcock loved and immortalized. Venerate today that quiet lobby, which remains a perfect time capsule of memories not your own. The new Santa Rosa postoffice building, which is to be erected on the corner of Fifth and A streets in this city, has been admirably designed to harmonize with our history, climate, and natural surroundings. The building will be of Spanish design and will present a pleasing contrast to our other public buildings in the city. The building proper has a frontage on Fifth street of eighty-two feet, and a depth on A street of fifty-two feet. In addition to this main building there is a portico across the front fifty-one feet wide by thirteen feet deep. The general construction of the building is brick masonry, laid in pure cement mortar, no lime whatever. To the height of the first floor the building will be faced with cut stone laid as “coursed ashlar.” This stone will probably be “Indiana Buff Bedford Limestone,” the finest building stone now obtainable in the United States. From the cut stone line to the rafter extensions, the plain brick work will be stuccoed in a rough cast “stipled” surface and nicely paneled and ornamented in mouldings. The roof of the building will be covered with the best grade of Spanish terra cotta tile, including ornamented tile hips and ridges. All of the lintels over the portico and door and window openings will be of cast reinforced concrete, and all sills will be cut stone of same as base course. The portico floor is reached by a set of massive solid granite steps forty-six feet wide. The roof of the portico is also Spanish tile, and is held up by two heavy masonry corners, and four stone columns, twenty inches in diameter, with heavy base and carved caps. The cornice of the entire building is overhanging with darkened beams and huge rafters. In all, the effect is one of massiveness and solidity. Each buttress on either side of the granite steps is surmounted by a heavy cast iron lamp standard, of highly ornamented design, and with five large opalescent glass globes to each standard. These lamps stand about ten feet high. The first floor is given over entirely to the use of the postoffice, the public lobby extends across the entire front of the building and is thirteen feet deep, with high ceiling and heavy plastered arches and cornices. At the left end of the lobby is a fine solid oak stairway leading to the internal revenue offices on the second floor. Another passageway at the left leads to the private offices of the postmaster and assistant postmaster. The workroom occupies all the central portion of the first floor and is practically two stories in height, as is the public lobby. The money order and registry department is at the right of the double entrance, and is separated somewhat from the general workroom. Large roomy vaults of reinforced concrete and steel are provided for all purposes. The floor of the portico and public lobby is of marble terrazzo laid off in panels. All of the base and plinths of the lobby will also be of marble. The second story at the left is arranged into a suite of offices for internal revenue officers with private vaults, toilet, etc. On the right of the second story are arranged a store room, “swing room,” and toilet room. All of the toilet rooms have terazzo floors and marble wainscoting. The large toilet rooms on the second floor have exceptionally fine facilities, including shower baths for employees of the postoffice. There will be a basement with ten-foot ceiling under the whole building given over to the heating plant and fuel storage, etc. The mechanical equipment of the building, including heating, plumbing, and electric installation, is superb and of the latest types throughout. The heating will have an automatic oil burning plant to operate a hot water heating apparatus. The plumbing embraces some of the finest fixtures made, most of which will be the John Douglas manufacture. All heating and plumbing pipes and fittings will be jacketed with asbestos pipe coverings. There will be four distinct electric installations, one for lighting, one for power, one for vault protection service and one for telephone service within the building. All electric work will be run in metal conduits. The inside finish of the building will be almost entirely of quarter sawed whiteoak for all doors, trim, fixtures, counters, desks, etc. All glass will be plate or ornamental opalascent glass. Wood floors will be of white maple. Artistic metal grilles at all screen openings and front doors. As a whole our new Federal Building compares favorably with other like [illegible microfilm] and while not so large and pretentious as some, it is fully adequate to serve its purpose. The building was designed by James Knox Taylor, supervising architect of the treasury, and its construction will be under the personal supervision of Mr. William N. Collier, superintendent of construction of public buildings, who is now in Santa Rosa. Hoyt Brothers have the contract to erect the building.